The underlying theme of lean thinking is to produce more or do more with fewer resources and less waste. After nearly 50 years, lean manufacturing is a recognized discipline — but the concept is just beginning to take hold in the distribution center. 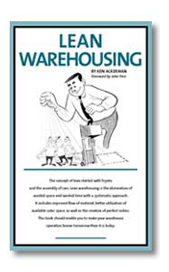 In Lean Warehousing, author Ken Ackerman takes this important concept and shows how it can be applied to the distribution center to cut waste, improve productivity, increase space utilization and meet increasing customer demands. To do this, he demonstrates how to apply lean principles to key warehousing functions such as receiving, put-away/storing, replenishment, picking, packing and shipping. Each section concludes with a list of action items which guides the reader from theory to practical steps that can be implemented in the warehouse. Its a practical approach that will help you cut the fat from your operations. The ultimate goal of lean warehousing is to cut waste for a more effective use of the limited resources of time and space. Lean thinking can be applied in your operation by implementing the five Ss: sorting, setting in order, shipping, standardizing, and sustaining. Since space is fixed, lean storage is a way to stretch the building through more effective use of existing space. While space is fixed, time is elastic. The lean operator uses that time to move materials through the warehouse as efficiently as possible. Material handling equipment and software systems are the most important tools that warehouse operators must use. Now you can use them more effectively to get lean. Often overlooked, there are many opportunities to cut waste in warehouse consumables such as fuel, electricity, packaging, package fillers, dunnage, disposable waste, and pallets. Whether you plan to build a new distribution center or rehabilitate an older one, taking a lean approach can reduce waste now and in the future. Getting leaner requires change. Effective leadership will be essential to implementing the lean techniques discussed in this book. This collection of checklists will enable you to measure your progress in becoming lean. Ken Ackerman has been active in warehousing management for his entire career. He served as chairman of Distribution Centers Inc., a public warehousing company, and as a management consultant at Coopers and Lybrand. In 1981 he formed The Ackerman Company, a management advisory service that specializes in warehousing and logistics management. If for any reason you are not totally satisfied with Lean Warehousing, simply return it within 30 days for a complete refund.